Quick notes: A soothing, refreshing, cucumber-scented sheet mask. The eye/nose/mouth holes fit well. Quick notes: The white lotion-y essence was very copious and soothing on sensitive skin. Fit's not bad. Quick notes: These wipes were very dry to the touch (I had to rub a lot over eyes and lips for stay-put makeup). They also had a weird mildewy smell that never went away. I don't think it was actually mildew, but it might've been because of the rice milk in the formula. I didn't notice significant ultra-hydrating benefits either. 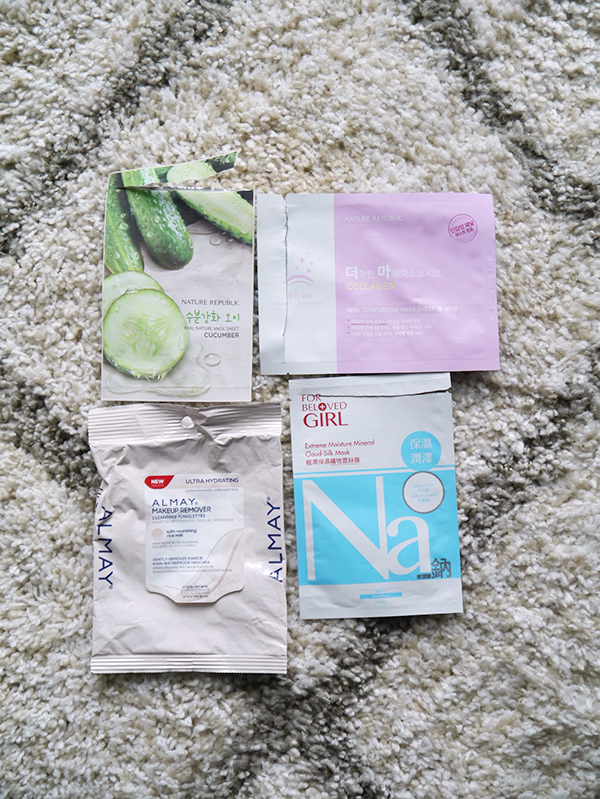 Quick notes: The sheet mask so nice, I featured it twice. Quick notes: Like the conditioner I featured in September's empties round-up, this is a perfectly adequate drugstore anti-frizz shampoo, nothing to write home about. Hubs used it up and didn't love or hate it; it just got the job done. Quick notes: I bought a small container of this body lotion a couple months ago because it was earning raves online for its ability to put people to sleep with its ultra-calming lavender and tonka scent. Pale purple, mostly natural, quick-absorbing body lotion. I enjoyed this product while it lasted. Alas, while the scent was deliciously sweet, it did nothing for my insomnia. Quick notes: Although I was using this charcoal-infused body wash along with the fizzy bath soak as a soothing foot bath, eventually I succumbed to using the body wash for its original intended purpose. The blood orange scent is all-natural and delicious without being overwhelming. The formula builds to a mild lather and doesn't leave skin feeling stripped. That being said, I feel like this body wash's detox benefits are best enjoyed in something like a foot bath. 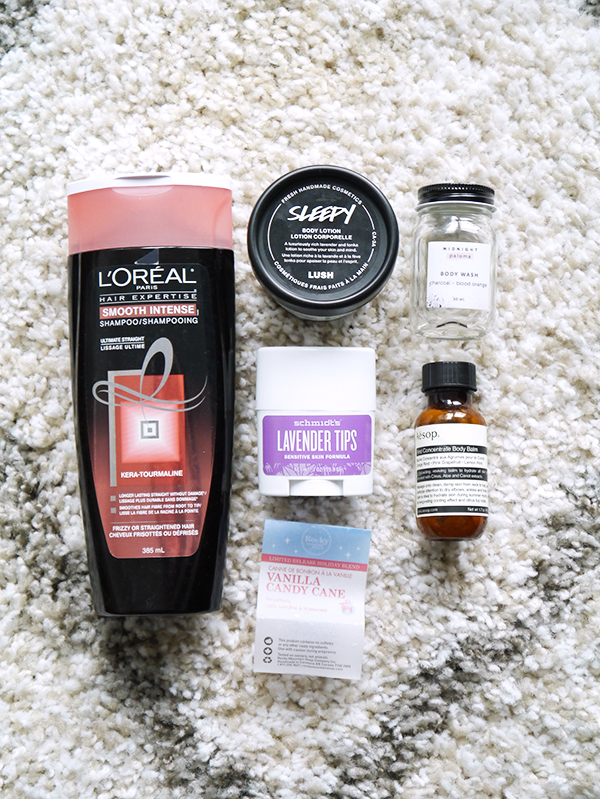 The charcoal doesn't seem to have much of a chance to detox when you use it as a body wash that gets rinsed off a minute after you lather up. Would I repurchase? Maybe the small size, for pedi season. Quick notes: I think this might be my forever natural deodorant. It works for me, I love the scent, and compared to other natural deodorants the price point can't be beat. Would I repurchase? Already have, but I bought the full size this time. Quick notes: This citrusy body lotion smells AMAZING and is quick-absorbing and non-greasy while moisturizing effectively all day. Too bad it's so expensive. Would I repurchase? No. I can't justify paying that much, especially knowing there are more affordable natural moisturizers out there that also have divine scents. Quick notes: So speaking of more affordable natural products with divine scents, Rocky Mountain's limited-edition vanilla candy scent really is the bee's knees. The soap not only smells good, it produces a rich lather that doesn't leave skin feeling stripped. This "empty" is kind of a cheat since technically I haven't used up the bar of soap yet. Quick notes: It's not horrible, but it's not remarkable either. And it didn't pass the smudge test. Quick notes: Pricy, yes, but the 002 Universal Dark Brown shade is a not-too-warm, not-too-dark match for my brows; the ultra-fine tip mimics the shape of brow hairs; and the spoolie on the end brushes stray hairs into place and blends out any harsh lines. Whenever I wear this brow pencil, I get compliments on how good my brows look. This might be my forever brow product. Quick notes: Is it fair to feature an empty when technically the product isn't empty, just possibly a dud? No matter how many times I swiped this eye serum back and forth, the rollerball didn't dispense any product. 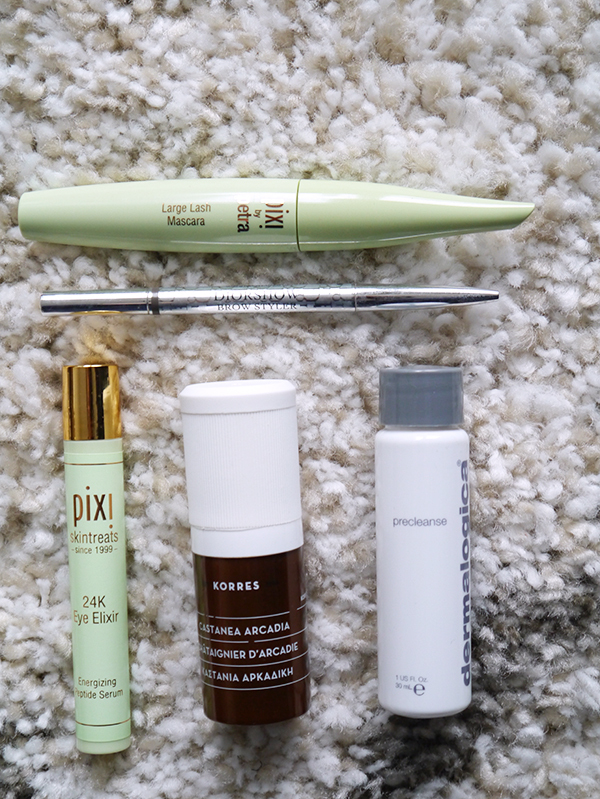 Forget about using it on the delicate eye area; the stuck rollerball produced A LOT of drag. Quick notes: This naturals-heavy eye cream from Greek natural beauty brand Korres uses Castanea (Chestnut) tree extract to fight wrinkles, puffiness and dark circles. The eye cream just feels like basic eye cream, no fancy texture or cooling sensation. Although the generous-sized 15 ml pump bottle lasted a long time, I didn't notice any significant improvement as a result of using this eye cream. 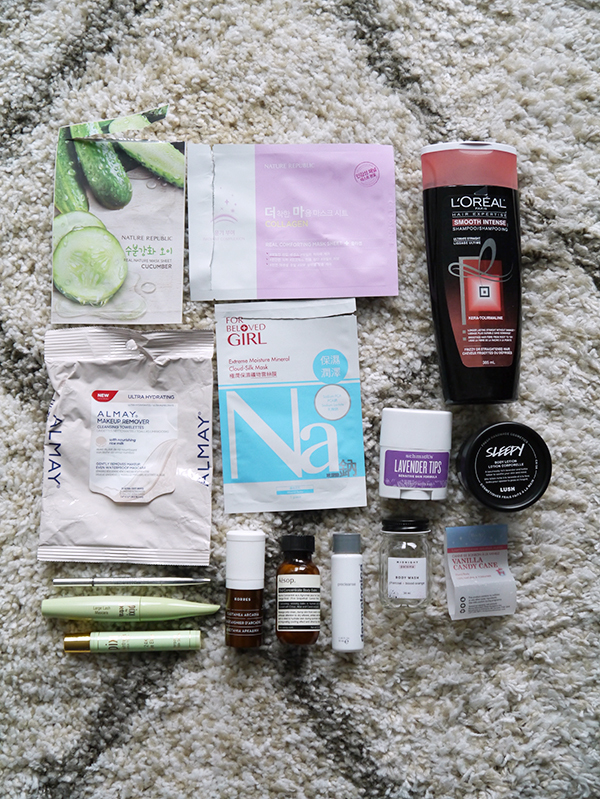 Quick notes: This little travel-size bottle lasted a surprisingly long time! Hard to believe that it was only a couple years ago when double-cleansing was regarded as a novelty, and Dermalogica's Precleanse was one of the few oil cleansers on the market. It works well and removes makeup nicely and has a lovely scent, but with all the oil cleansers and micellar waters out there at different price points it's no longer a Holy Grail product.